Part of my role as a content strategist includes performing a content inventory and audit of existing content on the website. The inventory helps me understand what is already there, and the audit helps me analyze my next steps- how much content needs to be re-written and how much can transition as is? To do that, I create a column in the content inventory spreadsheet for me to call out any content that has ROT. Because we don’t speak in acronyms here, I’ll spell it out for you. It’s not out of the ordinary if a piece of content is redundant, outdated, and trivial! So why am I sharing this with you? Because I want to show you a way to make it easier for your residents to find what they’re looking for while also making it easier for your content authors to manage their own content. That’s 11 thousand pages and 10 thousand documents- like PDFs- that need to be maintained by employees. Those numbers are overwhelming, but it’s not a bad thing. Think of it as 11 thousand opportunities to improve our digital content. And all of that content has to be combed through not only by search engines, but by the internal search function in order to pull up relevant information. In my experience managing content- both as an author and as a content strategist- it is very difficult to maintain even a portion of that amount of content. Instead, what happens is that all of that great content starts to rot- which is never good news for anyone. So once you find content that is stinking up your website, how can you clean it up so that it’s fresh and ready to go? There are a few ways to get rid of the redundant, outdated, or trivial content. Rewrite content so it is relevant and timely. Rewrite page to include more evergreen content that doesn’t need to be updated as often. Archive, or unpublish, the page in question. During our Funshops, we heard from content authors and publishers that as much as they tried, it felt like they were never quite able to stay on top of their department’s content. One Funshop participant told us that she was still clearing up discrepancies between pages, and she is not new to her role. She asked how residents would know how to find correct information online, if it was challenging even for City of Austin employees? 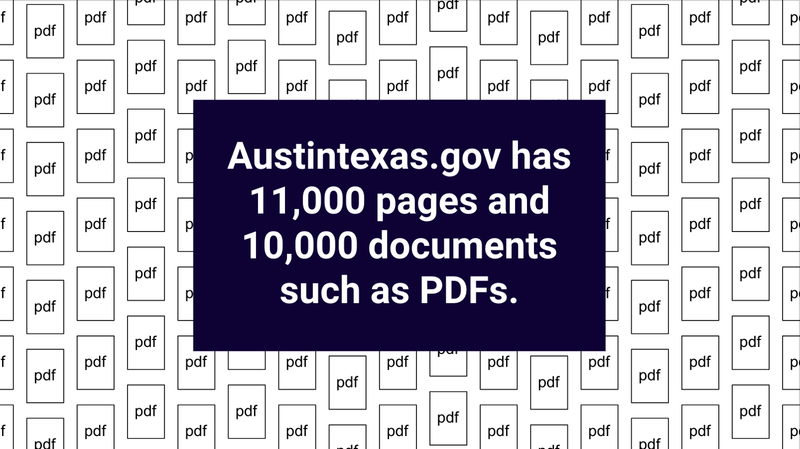 Between qualitative data- like the stories we heard from talking with employees- and the quantitative data we got from analytics, we know that 11,000 pages does not serve residents. Even as City employees, they don’t always know how to find what they are looking for. The key is simplifying the content, and archiving the excess. I hinted at this earlier, but it needs to be said- when content authors and publishers archive their redundant, outdated, or trivial content, they are making their own jobs easier. For example, content authors would only have to manage 50 pages instead of 250. Instead, they can focus on researching what residents need and then creating that content, as well as their other day-to-day responsibilities. We spoke to content authors and content managers in several departments: Development Services, Parks & Recreation, Office of the Police Monitor, and Resource Recovery. A common theme among every department was that it was easy to lose track of content, because so much of it existed. We learned that archiving content was not a standard practice for our authors, and we’re changing that by showing them how archiving redundant, outdated, or trivial pages also makes it much easier for residents to find what they need. First, because they don’t have to worry about finding conflicting information. You, the content author, made sure to archive pages that had bad information on it, making sure that a resident would only find updated content. Second, residents can find what they need because the filtering within the search function is more effective since there are fewer redundant pages to get through. Plus residents (and search functions) don’t have to waste time reading (or filtering through) duplicate- or redundant- content. In my research I found content that was over 4 years old, which would have been cool if this were a time capsule, but it’s not. Finally, archiving all of those redundant, outdated, or trivial pages helps give you a clearer picture of what your residents are looking at thanks to analytics. Over time, your data will accurately reflect a resident’s journey to learn about city services, especially because residents aren’t landing on those “rotten” pages anymore. Working in the public sector, I understand that certain departments are required by law to have pages published online for a certain amount of time. Those are not the pages I want us to focus on. However, I will say that if you are trying to archive content and are being told that you can’t- it’s okay to push back. Talk to Legal yourself to make sure it’s not just office lore saying you have to have that page up. I want to hear from you all- how does your department keep things fresh?